Found 5 file extension associations related to GeoExpress and 1 file format developed specifically for use with GeoExpress. 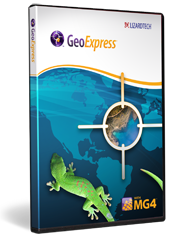 GeoExpress combines the strengths of the industry-standard image compression format, MrSID, with the ISO-standard JPEG 2000, and integrates powerful image editing and manipulation tools such as reprojecting, color balancing, mosaicking, cropping, despeckling and more to bring you the most advanced geospatial imaging software on the market. So whether your project calls for MrSID or JPEG 2000, GeoExpress has got you covered. If you need more information please contact the developers of GeoExpress (LizardTech, Inc.), or check out their product website.